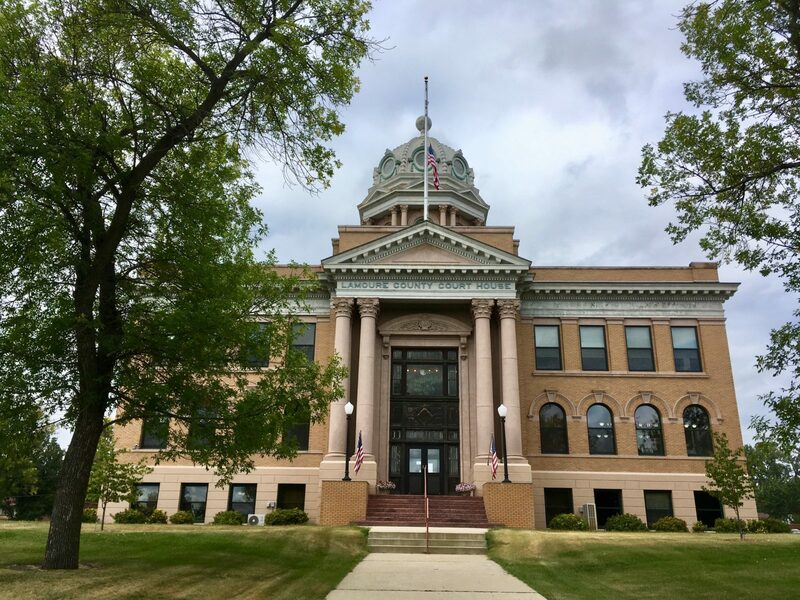 Greetings from the historic LaMoure County Courthouse in LaMoure, North Dakota! Built between 1908-1910, the courthouse replaced the original building which now houses the county museum near Grand Rapids, North Dakota. A bitter dispute over the location of the county seat had played out in the late 1800s between Grand Rapids and LaMoure, even culminating in violent confiscation of documents, but after all the dust settled, folks from around the county came together to build this impressive structure, and the rest, as they say, is history! 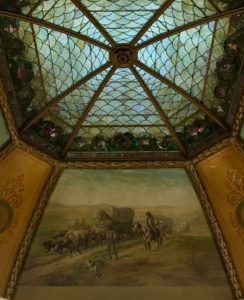 The interior view of the dome is spectacular, reminiscent of painted domes such as I’ve seen in Washington, D.C. or even Europe, but what makes this one special are the scenes themselves as they depict life on the prairie from multiple perspectives. 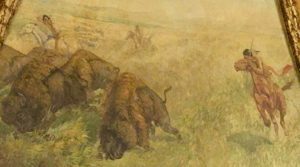 My favorite scenes in the dome include the wagon train headed west and the American Indians hunting the great American bison. Nice article, JD! I enjoyed the pics and notes. I have the distinct privilege of working in this courthouse for the past 31 years and counting. The county takes pride in our beautiful building and has painstakingly restored it and maintained it in this nearly authentic condition. It is truly a landmark and worth a visit just to see it. 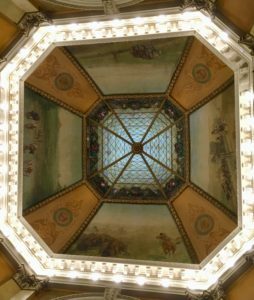 Thank you for doing such a lovely tribute to our treasured courthouse! Thank you, Karin, and welcome to Prairie, Party of One! The courthouse has always been one of my favorite sights to see in the area. Bravo to the restoring and maintenance teams!